There's a burst of flavor waiting for you when you pop one of these bumpy little gems into your mouth. 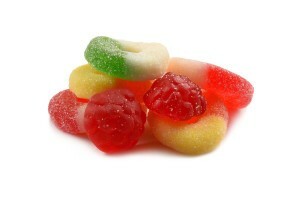 Gummy red raspberries are a perfect size treat for little hands. Their bright red color makes them an ideal party table treat whether it's the holidays or summer celebrations. Freeze the gummies and you'll have a refreshing, flavorful summer treat. Corn Syrup, Beet Sugar, Gelatin, Sorbitol From Fruits & Vegetables, Citric Acid, Fd&C Red #40. Natural And Artificial Flavors, Vegetable Oil and Carnauba Plant Wax Used For Antisticking. These are the BEST gummy raspberries we’ve been able to find online! Such a good price for a huge bag of them too, can’t recommend them enough! I love the raspberries! They’re so juicy and delicious. Can’t wait to use them for Valentine’s Day. 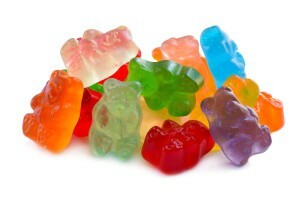 The gummy raspberries are delicious! Can’t wait to use them for Valentine’s Day! Loved these! It also smells really good. YUMMY!!! These are so soft and flavorful, and a FANTASTIC value! I could not believe how huge the bag was for just $2.50 when they arrived! Will definitely be buying these again!